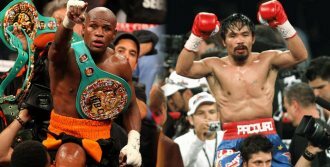 Hours after Floyd Mayweather Jr.’s highly anticipated announcement that made his May 2nd mega-bout with Manny Pacquiao official last Friday, sports books of the MGM Resorts in Las Vegas also made official the betting propositions for the highly anticipated fight between the two. The unbeaten Mayweather opened as 2:1 favorite against Pacquiao, ten weeks ahead of their unification match at the MGM Grand Garden Arena, the MGM Properties' premier event venue. Mayweather (47-0) is a -240 favorite ($240 to win $100) while Pacquiao (57-5-2) is +200 ($100 to win $200) in the initial opening line from The Mandalay Bay Race and Sports Book Friday afternoon. But those lines immediately changed Saturday, one day after the announcement, as bettors flocked to the various betting sections of the casinos of the MGM line, hoping to get the earliest possible return on their investment. As of 4 o'clock in the afternoon Saturday, Mayweather is now at -220 and Pacquiao at +180, a 20-point change from yesterday’s opening lines from the same resort. This early action in the casinos of Las Vegas is just the beginning of what is projected as a possible seven figure transaction for this mega-fight at both the Gambling and Fight Capital of the world. The Sports Book sections of Las Vegas are predicting massive betting for Mayweather versus Pacquiao, especially on days leading to May 2nd, when people make their trek to Sin City during Fight Week to witness the biggest boxing extravaganza of this decade. “They have been betting on Pacquiao,” said Lily Ragadio of the Mandalay Bay Sports and Race book, “and that’s why Pacquiao dropped from +200 to +180.” she added. Pacquiao has always been the favorite against his previous nine opponents and in his previous eleven fights in the last six years dating back to 2009. The last time the Filipino slugger was an underdog was against Oscar De La Hoya in December of 2008. The bigger, taller and more experienced De la Hoya was a 3:1 favorite against Pacquiao then. Pacquiao demolished De La Hoya in that fight, forcing him to submit in the 8th round of what was De La Hoya’s final hurrah in the ring. The other proposition offered Saturday was for the duration of the mega-fight between Mayweather and Pacquiao. A proposition that their bout “will go” 11 full rounds and beyond is at -300 while a +220 price tag awaits those who will be betting that the fight will end before the bell of the 11th round is tapped. You can reach the author at rrmaze24@aol.com and is on Twitter @Freemazon910.